On December 17 from 7:00 to 9:00 I will be holding a novice fly tying class at St. Simons Outfitters. We will tie some basic salt water flies such as a Clouser minnow and one of my original flies, the Prawn's Revenge. There is a small charge to cover the cost of materials. On Saturday afternoon, December 21, I will be giving a casting demo showing the basic components of fly casting, curve casts and double haul. Give Ellen a call at 912-638-5454 to reserve your spot for the fly tying class, or just drop by on Saturday at 3:00 for the casting demo. 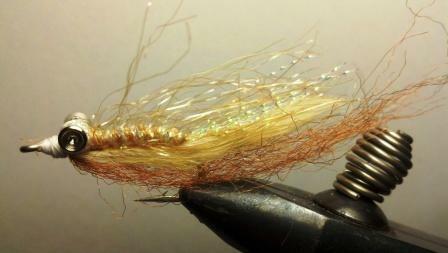 Over the last few months, I have given tying instructions for two variations of these flies. My client Tim Asbury introduced me to flies tied with UV acrylics last fall. He ties a fish catching version with a rattle. Below is a video link that shows Tim tying this super effective rattle shrimp fly. Tim's version of the rattle shrimp is tied with the tail toward the hook eye. The tail pushes water and is effective in stained water. I tie a different version of this rattle shrimp, similar to the Crystal Shrimp, with the horn over the eye. Next month I will show photos of this tie. Consider tying and fishing some of these flies and invest in some UV acrylic fly tying material. I think you will be impressed. When we are chasing red fish on the flood tides, we constantly flush Clapper Rails, or Marsh Hens. We always hear these birds cackling away. I like to say to clients they are laughing at us trying to catch tailing red fish with the long rod! Marsh Hens, are secretive little birds that hide at the base of the marsh grass and feed on invertebrates found in the marsh. They do not like to fly, and you rarely see them unless we have unusually high tides. When we have flood tides they are pushed out of their hiding places in the marsh and hide on higher patches of grass and on marsh racks. To hunt them, we pole close and flush them. Because of their habits, the only time you can effectively hunt them is when we have EXTREMELY high tides. Forecasted high tides of 9' are preferable. Fred booked me for earlier in the year, when we could fish for tailing fish in the grass and shoot Hens. We weren't able to keep the first dates in October, so we re-scheduled to November. By that time the water temps were too low for tailing fish, but did we have a ball jumping Rails. 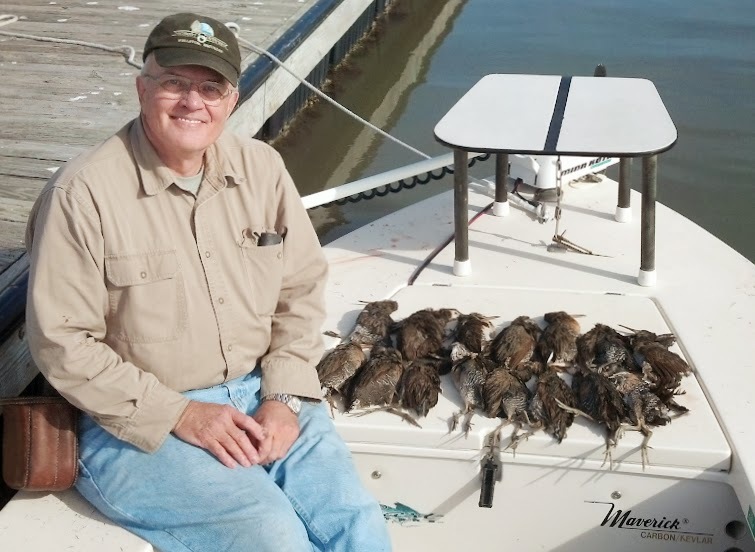 Fred took a limit of birds in about three hours. He is a fantastic shot, and did not miss any of the birds he shot at. Let's get ready for next year, and consider a cast and blast in early Fall. It it impossible to mention all the great people I had the privilege of taking fly fishing in St. Simons this past year. 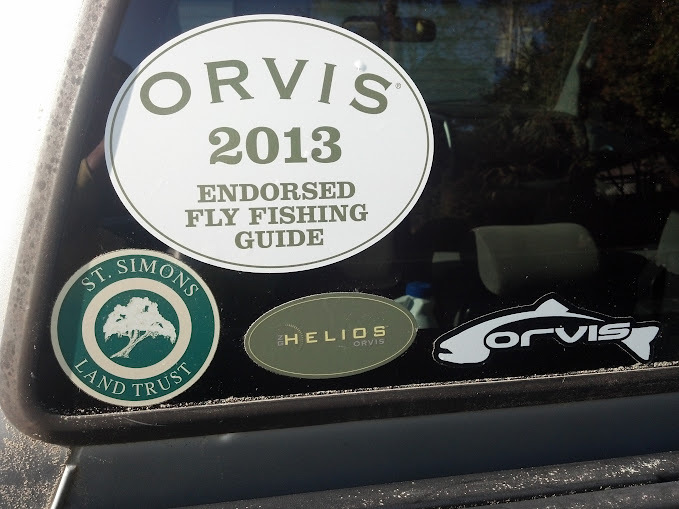 Thanks to all who chose Fly Cast Charters for their fly fishing adventure. Thanks to Christian, Bill, Lou, Richard, Tim and many others who had the chance to experience our big winter time schools of red fish. Thanks to Bill, Ben, Don and Don, Howard, Frank, Elden and many others that fished with me this Spring for Red Fish and Triple Tail. 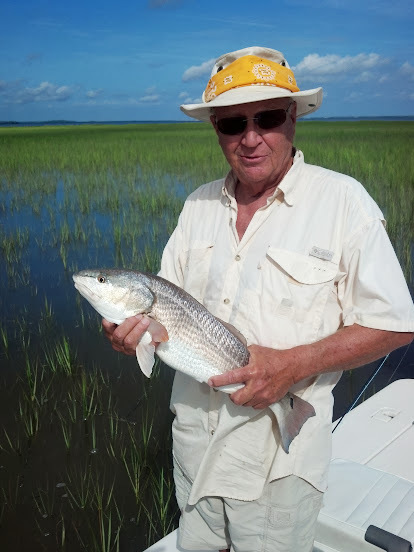 During the Summer, so many of you had the chance to fish low tide and flood tides for tailing red fish. I hope John, Ed, Kevin, Rick, Jerry, Paul and Bobbi, AlIan, Pat and too many others to mention have great memories of fly fishing in St. Simons. Fall saw Tim, Matthew, Spencer, Brian, Bart and crew, McLean, Ed, David and many, many other folks come to St. Simons to fish. Fall is over and winter is here. The red fish are back into big schools, and they are marching up and down the flats. 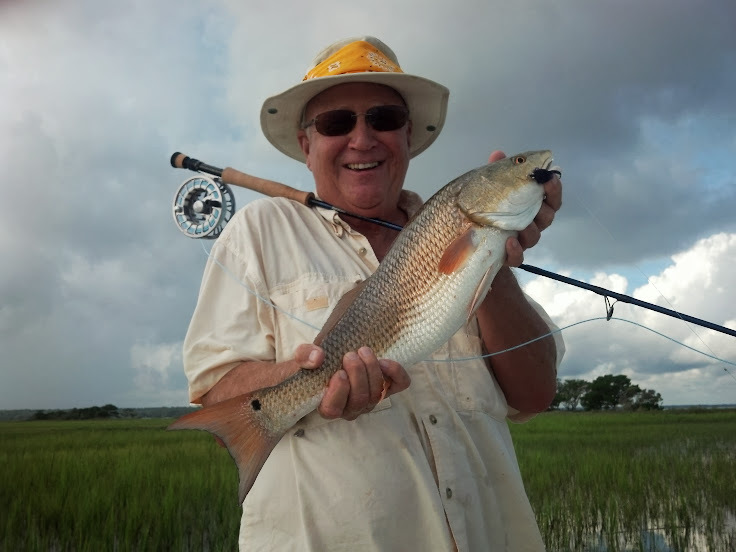 Sight fishing in the Winter can be fabulous in St. Simons, but it is highly weather dependent. Fronts move through on a regular basis. Normally the fishing is best two or three days after a front has passed through. In the winter particularly, we hope for clear skies and light winds. In conditions like that we can see the schools on the flats from fifty yards away. If you are in St Simons over the holidays, give me a call, and set aside a day or two to go fishing. I can be flexible at this time of year, so if the weather isn't great one day, we can reschedule to another day. Give me a call to schedule your time today. I can't express my appreciation to all my clients that have fished with me over the last several years. I love showing everyone our terrific fly fishery. I also love introducing people to the sport of the long rod. There is no question that there are more effective ways to catch fish in the salt water, but there is no more challenging way. Floating live shrimp under a float rig or pulling a DOA under a popping cork is fun, but once you experience the thrill of sight casting to a ten pound red fish or a large triple tail and watching them inhale a fly, you will be hooked for life. I do my best to give people a positive introduction to this sport and promote conservation oriented fly fishing in St. Simons. 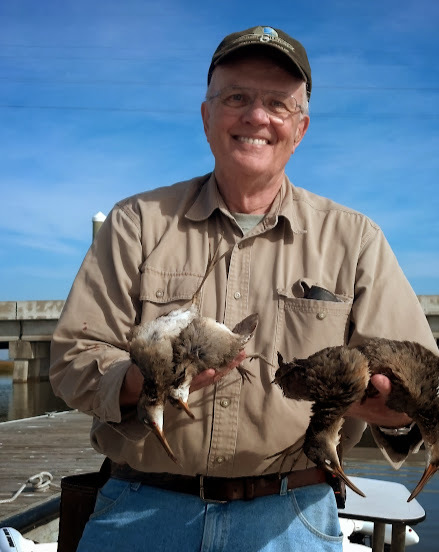 Please be sure to give me a call if you are coming to the Golden Isles, and let's go, "Hunting Fish in the Marshes of Glynn." If you come to St. Simons, be sure to visit St. Simons Outfitters. Ellen has vastly expanded the fly tying area. She is fully stocked for Christmas with Barbour, Patagonia, Marmot and Orvis brand merchandise. She is also expanding the line of local fly patterns and will soon begin carrying some innovative patterns from Chris Webber of Brack n' Brine products. If you are going to fly fish in St. Simons, go by St. Simons Outfitters, pick up a few of these flies and catch some fish.